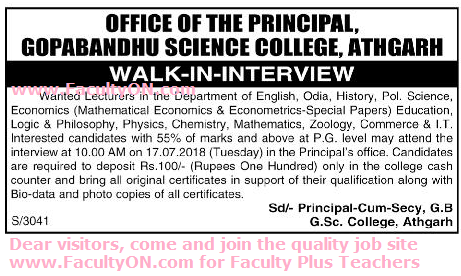 Gopabandhu Science College, Athgarh has advertised in the SAMAJA newspaper for the recruitment of Lecturers jobs vacancies. Interested and eligible job aspirants are requested to walk-in on 17th July 2018. Check out further more details below. College Profile: GOPABANDHU SCIENCE COLLEGE is an excellent center of Arts, Science & Commerce education. Its value based quality education and timely assessment of knowledge through internal Quality Assurance Cell full fills the needs of the day. How to Apply: Interested and eligible candidates are requested to appear for Walk-in interview along with CV, originals & copies of certificates and recent PP size photo to the following walk-in address.